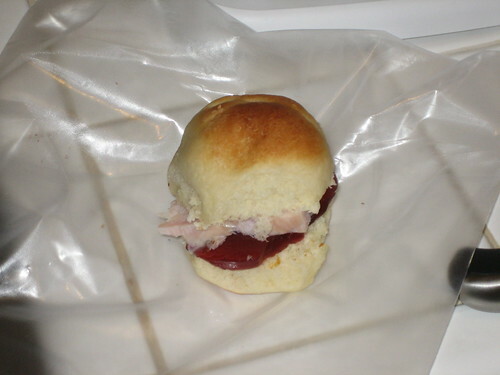 A late night snack consisting of a thanksgiving roll, turkey, and cranberry sauce. If your meal produced the leftovers requires to assemble this, your thanksgiving was officially a success ;). The BBC has announced they’ll be releasing a new version of Day of the Triffids next year! Flesh eating biofuel plants, what’s not to enjoy? Hopeful it’ll be Dr. Bill Masen PhD. I’m not sure how having an MD would be relevant to a fight against murderous plants, but you never know. After work today I moved this blog to a new website. It was actually surprisingly complicated to copy the SQL database over, but now everything seems to be working successfully. Drop a comment if you notice any broken features on the site. I’ve heard the reverse statement plenty of times in labs I’ve worked it. “If you can bake (/cook) you can do PCR.” I even used it once myself when I was training a girl at the Danforth Center. And it’s true. Today I performed rtPCR which required mixing a lot of different chemicals in little tubes, heating them to very specific temperatures for very specific lengths of time, and siting around bored while biology happened. 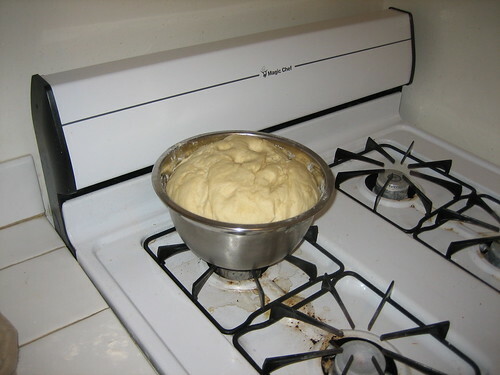 Today I also made the dough for my father’s thanksgiving rolls. I was fortunate in that he had the recipe written up in terms designed to make sense to molecular biologists (“reoil lightly, cover with plastic wrap and store in the 4°” <– what lab rat’s call a refrigerator). Once more, the process consisted of mixing ingredients in bowls*, storing at approximate temperatures, and feeling bored while yeast biology happened. It looks like I might actually manage to pull these rolls off and they, along with Senator Russell Sweet Potatoes are my personal vital thanksgiving foods. *A cooking pot can stand in for a mixing bowl when all of my (1) bowls are already in use, as can the removable bowl of a rice cooker. My next fallback was going to be the crock pot, and I still may need to call it into service if the dough rises as much as the recipe suggests it will. These guys think there’s a 75% chance that the author of this blog (me) is male. This week has been more the way I pictured grad school. Up at seven AM again. Worked a nine hour day at the PGEC. I got my badge today. It’s always a cool feeling to be associated with a powerful organization. It was one thing when it was a major corporation, but now I’m connected to an arm of the federal government! You may have seen the news about the wholly mammoth genome that’s been published (actually it’s less than 70% of the genome, and normally you need 2-6 fold coverage to be considered a reasonable genome.) What I thought was really interesting was the article published in nature along with these results, discussing what technological hurdles remain between us as the ability to resurrect the mammoth. This guy thinks Iowa has surpassed Missouri as a bellwether state. I got up at 7 am this morning and got to work by eight. I wore real shoes (not flip-flops) for one of the first times since I moved to Berkeley. I work in a goverment building, with sign in sheets, and ID badges, and filters on the internet. I didn’t even get the chance to talk to my new PI today, but I had the e-mail he’d sent me about my rotation project, so rather than sit around and waste time I started to work on it. Did you know FT has 13 homologs in rice? And I found even more homologs in maize and mapped them on to the tree of rice genes using reciprical blasting. The other people in this lab are really nice too. Two post-docs and one other grad student. When I got home I realized I was babbling at my roommate about my exciting first day. We tend to be introverted around the apartment most of the time. I hope she doesn’t think I’m going insane. I also got an internet server working on my low power linux computer! It required a bit of tinkering to get around using the standard http port (most ISPs block connections on this port for residential costumers to discourage people from hosting web pages at home (like I just did!)). The page itself is just a proof of concept… I still haven’t figured out what I want to host at home (rather than using the hosting account I use for this blog) but it’s another advantage of an always on computer. I finished my first rotation on Friday. It was a lot of fun working in the lab, and at the end I gave a reasonable presentation. And on Monday, my next rotation starts. So this weekend I have no science related responsibilities… what could I possibly do with my new free time? We’re somewhere in that crowd.